Cecile Clerc is MRG’s Head of Development and Partnerships. Here she explains her passion for global health and how no one should be left behind. My almost obsessive interest for the World Health Organization (WHO) started when I read L’Adversaire by E. Carrere. It’s the true story of this guy who has lied all his life about being a doctor and pretended he was working at the WHO. He would go to Geneva on an almost daily basis and sometimes stare at the window of ‘his’ office until…( no spoiler here). Well, I am somehow like him (minus the fact that I have never pretended to work there). I watch from a distance everything the WHO does: responses to world epidemics, new guidelines on diabetes, mental health…I am truly fascinated. On 23 May, Dr T. Adhanom Ghebreyesus was appointed. Describing his priorities as he accepted the position, he reinforced the need to guarantee universal health coverage and promised to stand up for the rights of the poor. I can only welcome such a position. It is unacceptable that in 2017 access to health still remains a serious challenge for the most vulnerable communities worldwide. A few years ago, MRG published a global survey on the health of minority and indigenous peoples, which shed light on the discrimination these communities experience when it comes to health: non-existent health services in areas where minority and indigenous communities live; poorer quality of care; patient segregation; access to health-related information available only in the language of the majority community; no respect for traditional cultural practices. Discrimination, both direct and indirect, is everywhere when it comes to the health of minority and indigenous communities. The consequences are terrible: international studies show for instance that indigenous children have worse health indicators than non-indigenous children and have higher rates of infant mortality. I really hope that the new ‘top doctor’ will manage to make a difference in improving the health of all, including the most vulnerable and marginalized. Heading an organization responsible for the health of all 7.3 billion people on earth is no small task, but I will certainly be following his work…from a distance. 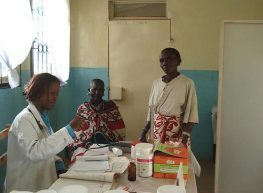 Read about minority and indigenous peoples’ experience of health care around the world on MRG’s Minority Voices Newsroom. Photo: Indigenous women in Kenya attending a gynecological clinic.